One of the original 6 franchise teams, the Bruins have been tearing up the ice since 1924. With 6 Stanley Cup wins, the Boston Bruins have made a name for the themselves. 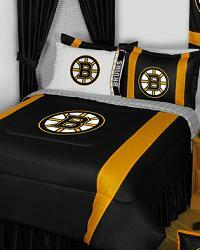 Show your Bruins pride with a comforter and matching sheet set. 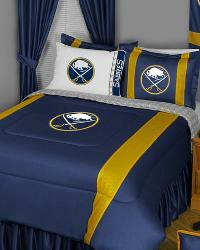 The perfect gift for any Buffalo Sabres fan, this Sabres bedding, sheet set and matching accessories adorns the the team colors and logo. Bringing the rough and tumble sport of ice hockey to the south, the Dallas Stars are really making a name for themselves in the NHL. Bring home this unique bedding and matching accessories all adorning the Stars colors and logo. As one of the original 6 members of the NHL, the Detroit Red Wings have a long history in the sport and is one of the most popular teams in hockey. Show your Red Wings pride with this great bedding and matching accessories. Having won the Stanley Cup more times than any team in the NHL and being the longest continuously operating team in the league, the Montreal Canadiens are one of the most well known and longest cheered for teams in North America. 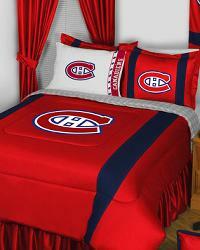 Let these awesome home decor items show your love of the Canadiens. The New York Rangers are one of the oldest teams in the NHL. You don't have to be in Madison Square Garden to show your Rangers pride. Deck out your room with these fabulous home decor items adorning the team color and logo. Bring home these FANtastic bedding and matching accessories each adorning the team colors and logo of the Philadelphia Flyers. Proving they are a team that never backs down, the Pittsburgh Penguins have played in 4 Stanley Cup finals, winning 3. Be the ultimate Penguins fan and deck out your bedroom with this awesome Pittburgh Penguins bedding and matching accessories. Winning 13 Stanley Cup championships, the Toronto Maple Leafs have a long tradition of winning. Show your Maple Leafs spirit with a bedding set and matching accessories each adorning the team colors and logo.